This time, with a full pot of coffee! Who knows where this might go? Yesterday I made a sudden decision to get my hair cut. Nothing drastic, just what Mr. Robert at Leon’s Beauty School describes as “my annual shearing.” I love Mr. Robert. Anyway, it looks healthier and bouncier and it will probably get curlier again because the weight is off. However, when I looked in the mirror this morning my first thought was of Snape looking back at me. Since I adore Alan Rickman, I suppose that is not altogether bad. I won’t dye it black, though. Maybe this summer I’ll do a wild color rinse. I’ve wanted to do that for a while. I need to lay off the electronics late at night. This is an addiction that has to be addressed immediately. Even melatonin is not working for me. Last night around 1 a.m. I gave up and finished “The Loving Cup” by Winston Graham, the tenth in the Poldark series. Then I went to my bookshelf with the intention of choosing something less fluffy, and picked up “Tropic of Cancer” by Henry Miller. I bought it because I knew it had been banned for decades and it was the number one bestseller the year I was born. But after the first dozen pages, I realized that I am not wasting time on it. I hated it. I flipped through it for another thirty minutes, reading excerpts here and there. It will go into the stack to sell to the used book store. The antidote to this is that I am also reading “Big Magic” by Elizabeth Gilbert, but small bits at a time. All right, I’ll confess – it is my bathroom book. I want to keep a novel in the currently reading list, so taking a cue from “Big Magic” I’m going to read Ann Patchett’s “Run” next. As I finish novels, they are going to the used book store or the Little Free Library down the street. There are a few that I will always hang on to, like my Lee Smith, Joseph Mitchell, and Wendell Berry books. And any autographed books. But the book purge is going to happen and happen big. I already donated eight books on book and paper arts to the Triangle Book Arts member library. I caught up on my tapestry diary for the week, weaving most of it yesterday. I thought that the rough brown yarn in the middle would be interesting to weave with, but it ended up falling apart as I wove. I think it may have been jute. So the rest of that will go in the paper bits bin for the next papermaking session. I hope that I’ll get to a little of that this year. I have work in two shows right now – a first for me! 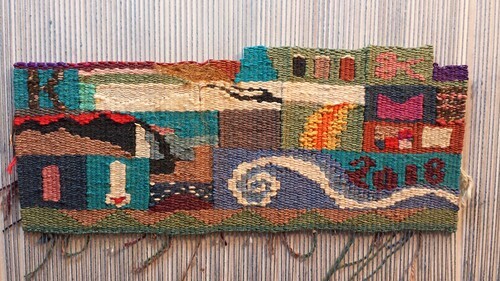 “98% Water” is currently in “A Strand, A Shape, A Story,” the Tapestry Weavers South exhibit at the Folk Arts Center on the Blue Ridge Parkway near Asheville, North Carolina. I have two books, “First, the Seed” and “Flow” in the Triangle Book Arts show “Re(f)use” in Artspace in Raleigh, North Carolina. “Flow” is hanging as part of a collaborative work led by Barbara Livingston, and it is definitely my favorite of the two books I submitted. I will photograph it when I visit the show. Both shows are incredible, and the book arts show will twist your head about what a book can be. 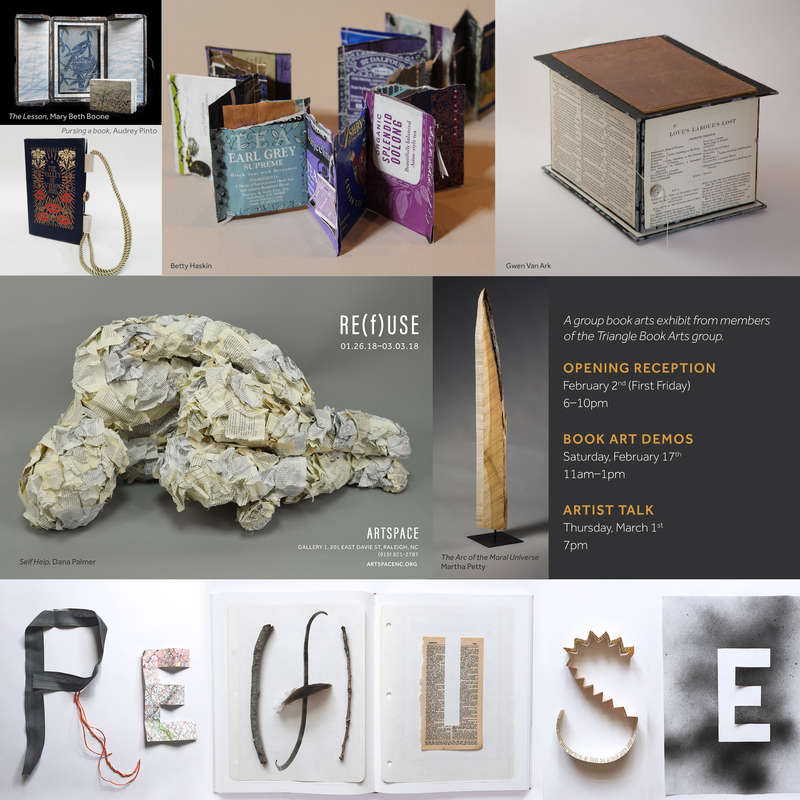 Opening reception for Re(f)use is on Friday, Feb. 2. I don’t know if I’m going yet. Feeling a bit shy and a lot agoraphobic about it. Okay, time to get to work in the studio.